It’s a big world out there, and Calexico’s music aims to encompass as much of it as possible. Since forming the band in 1994, singer-guitarist Joey Burns and percussionist John Convertino have explored the unlikely crossover between indie rock, Southwest twang, and Latin sway. Expanding its lineup over the course of many arid, atmospheric albums, Calexico has collaborated with Tortoise’s Doug McCombs; Iron & Wine’s Sam Beam; My Morning Jacket’s Jim James (on the soundtrack to last year’s I’m Not There); and Spanish rocker Jairo Zavala—all while avoiding drifting off into a world-beat fusion mess on its recent full-length, Carried To Dust. 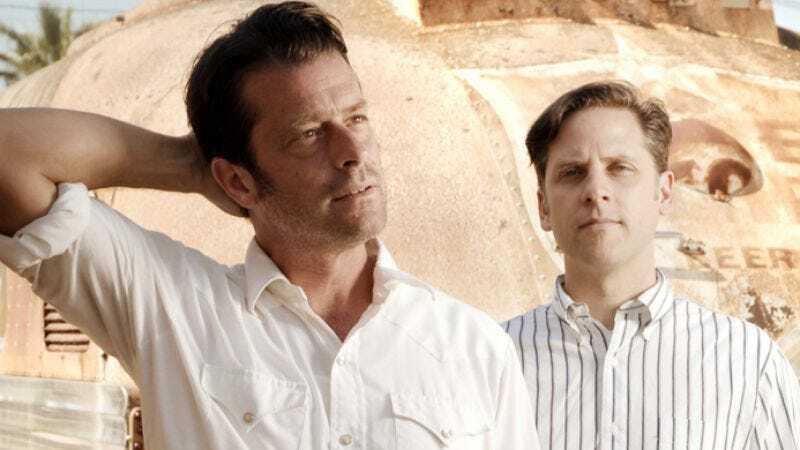 Before Calexico's Friday show at Antone's, Burns spoke with Decider about the group’s team-ups and guest singers in snorkeling gear. Decider: Calexico is known for its collaborations. What keeps you interested in working with so many different artists? Joey Burns: Just the fact that you’re around for so long, it’s only natural that you want to spread your wings and go somewhere new. You want to challenge yourself. We’ve always done collaborations, but we’ve always kept the influence of guest singers or musicians to somewhat of a minimum. I think it all stems from John and I being multi-instrumentalists and collecting as many influences as we can and seeing if we could pull it off. Working with people like Sam Beam or Neko Case, it allows you that perspective. That’s so crucial; you don’t often get that when you’re in an insular, four-piece band. I think that’s why there’s only a certain life expectancy of a band like that. We change it up and do different things. D: When you were writing Carried To Dust, did you plan to have so many people come in and help? JB: Not at all. At first we wanted to make a straightforward record, just with the band. Eventually I thought, “You know, this song really would sound great if Sam Beam would put a vocal on it,” despite the fact that it was already mixed and ready to go. I had seen Sam a couple nights before; he was extremely busy between tours, the birthdays of his daughters, all this stuff. I just put the idea to him and said, “Only if you have time.” And he wound up doing it. I was like, “Wow, that was easy. Maybe I should get more people involved.” One thing kind of led to another. The last track on the album, “Contention City,” I knew there was one thing missing from it. It was that Doug McCombs touch, the kind of ambient guitar playing of his with the vibrato and the delay. He came into the studio did it in one take. He nailed it. It all went pretty smoothly. D: How do those collaborations translate to the stage? JB: It’s really fun. Probably the most unusual person we had onstage was this guy, Vinicio Capossela. He’s from Italy. Sometimes he goes off into this strange operatic voice, but a lot of times he stays down in this low, gravelly one. I guess he could be comparable to Tom Waits, only he’s Italian. His song, “Popo,” is a bonus track on the Italian version of the album, of course. We asked him, “What do you want to sing about?” And he started singing [adopts Italian accent]: “Popo, Popo de amor. Popo the octopus, he’s in the ocean, and he’s surrounded by ink, so he’s always looking for his companion. He’s got eight arms, but he can only hold himself!” He just went off. When we played the song live with him in Italy, he told us, “I have an idea for maybe an outfit for the song.” We told him, “Go for it. Whatever you want to do, Vinicio.” So he came onstage wearing a black top hat, a black cape, a snorkel, and goggles. He also wore some gloves for beginner swimmers, these blue gloves to make you swim faster. He wore those while he sang, spreading out his hands the whole time. He crouched way down close to the floor. He was this octopus. He really got into it. The crowd loved it. D: Calexico is almost always described as a mix of Southwestern sounds and indie rock. Do you feel that’s accurate? JB: It’s a starting point. Like every artist that hates being described by what they’re known most for, it has a tendency to itch at you. You want to shed that layer, that description. There’s a lot more there. I think the people who get what we do, the people who come to the shows, like that fact that all of a sudden, in Amsterdam, there’s this Dutch band of seven people with banjo, the guitarrón, the Mexican bass, and a steel drum up there with us. I think that element of surprise is an essential ingredient to what we do.